Back to School Organization: All Those School Papers! Whether I (or my kids) would like to believe it or not, Back to School time is getting near. Sales are popping up everywhere. I’m starting to receive emails from their schools about Back to School nights. My 9 year old groans when we say anything about the month of August. It’s here and I want to be organized to start off the year right. 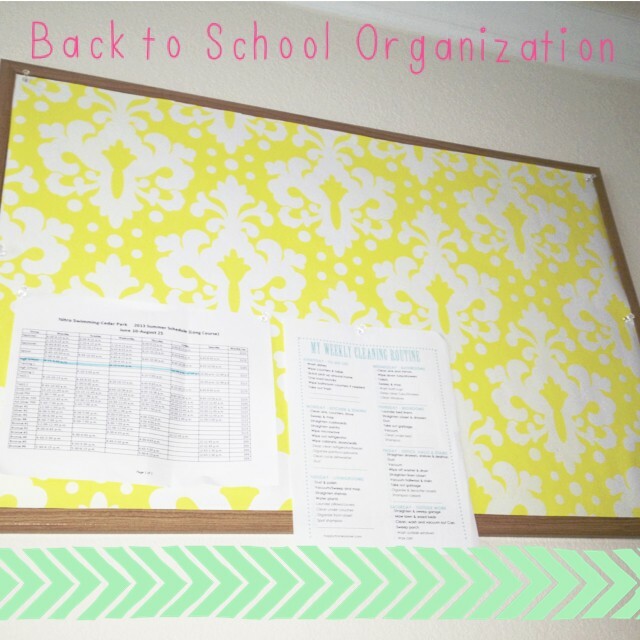 So, for our lovely MomFabulous readers and myself – I’m starting a Back to School Organization Series. We’re going to tackle all of those areas that need some little TLC before school arrives. Getting these areas in your home organized before school starts will help make that first week of school a lot easier on everyone. I have two kids in high school now and they definitely come home with less paperwork – which is nice. But, I still have one child in elementary school and he comes home with something just about every day. No matter what grade they’re in, you need a system in place for sorting, filing and storing paperwork. I have a system set up that works great for both myself, my husband and my kids. For example, my highschoolers have summer assignments they have to do. My daughter had a little freak out moment during our recent move when she didn’t know where her summer assignment paper was. Thankfully all I had to say was ‘Check your file’. Here’s the system I have set up. 1. Immediately Sort Through Their Papers. As soon as they arrive home, I go through the papers they give me. It either gets tossed, requires an action like signing it and putting back in their backpack or filed. I have a very simple filing system that has worked well for several years now. Each kiddo has their own file where important papers that we need to keep throughout the year are stored. For example schedules, letters from teachers or an explanation of a large assignment that is due by the end of the year. I also have a file labeled Do Now and one labeled Do Later. The Do Now file is for papers that require immediate action but I can’t get to it right at that moment. For example a paper that needs to be signed, but we’re headed out the door and I don’t have time to do it right then. The Do Later is for items that are important, but I can deal with them – well later. It’s simple. It works for us. 3. Store Art Work in a Plastic Storage Container. Obviously once they get into middle school and high school, the amount of art work that comes home diminishes. But when they’re in elementary school, it feels like they bring a masterpiece home everyday. If I’m not displaying it on our bulletin board (which I’ll show you in a minute) or they don’t want it in their room, it goes in a plastic storage bin under our bed. At the end of the year, we go through it and keep just a few masterpieces. 4. Schedules & Other ‘Need to Be Seen’ Important Papers Go On The Bulletin Board. I keep my son’s swim schedule, our daily house cleaning schedule and other important papers that need to be ‘seen’ on our bulletin board. I also put any papers that received a good grade or an awesome piece of art work they are proud of on the bulletin board. This keeps our refrigerator paper free – which this mama likes. The bulletin board is stored above our computer area and is easy to see and get to. I spruced it up a little with some cute wrapping paper from Target. I can easily change out the decor on it as I want. Thanks for sharing our Monday’s Minute Makeover! 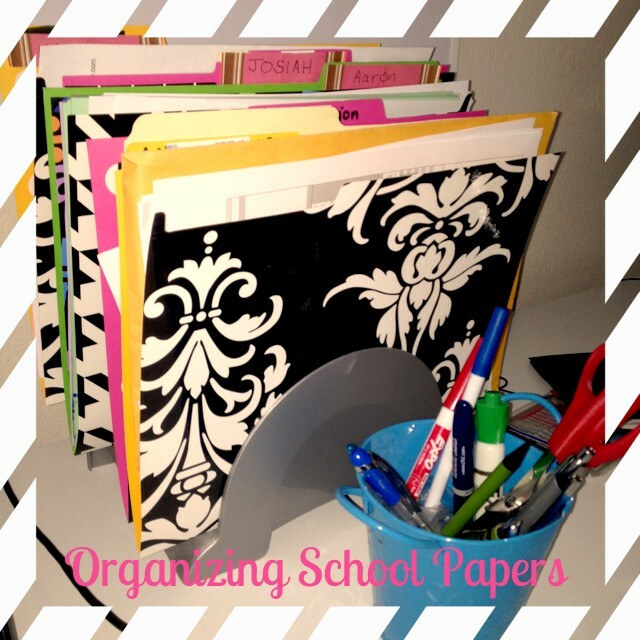 Thanks so much for sharing the link to our paper organization post. This is such a helpful article…. school papers can get SO out of control!